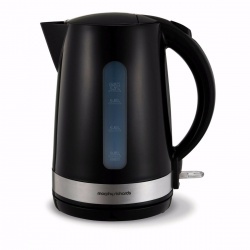 This 1.7 litre kettle boasts a powerful 2.2kW boil that ensures you're ready to make your cuppa is no time. The lock lid also helps to prevent accidents. This Kettles comes with a water gauge to allow easy view of water level and a thermal cut off safety switch that switches off the kettle if there is any overheating. Designed to be completely lightweight this travel kettle comes in a modern white plastic that’s super light and small in size – perfect for fitting into your suitcase. You may be on a caravan holiday at the coast or out in the wilderness on a camping trip, the Travel Compact Kettle ensures you can always count on a good brew wherever your travels may take you. Bring a little home comfort to wherever you are because everything’s made better with a good cup of tea. We know you need more than a kettle to make a delicious cuppa, that’s why the Travel Compact Kettle also includes two cups and spoons so you have all the essentials to make a good brew. Being small in size and light in weight this kettle is perfect for an easy brew wherever you are in the world. But don’t be deceived by its size, this kettle is not only the perfect size for a quick cup or two but it’s also extremely powerful in performance. The Sona Range of Small Appliances offer the best in range and value. Crafted for those looking for a simple solution, Sona is sure to suit to the needs of the busy home, a bustling office or the student leaving home. This 1.7 litre kettle boasts a powerful 2.2kW boil that ensures you're ready to make your cuppa is no time. The lock lid also helps to prevent accidents. Along with this black model, it's also available in white or stainless steel. Bring a touch of style and functionality to your beverage making endeavours with the Darwin Jug Kettle from Russell Hobbs. With a generous 1.7 litre capacity, the kettle is the perfect size for sharing a brew with friends – and they'll never have to waste time waiting for the kettle as the 2200W boiling power means that the water is swiftly brought to a boil. Designed with you in mind, the kettle also has an easy open lid that makes it simple to refill, while the water window ensures that you don't overfill. 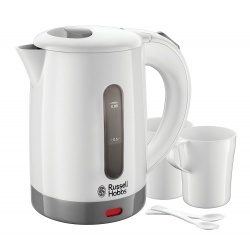 If you're looking for a kettle for everyday family use, then look no further than the Russell Hobbs Darwin Kettle. Kettle with modern design to give that perfect look for your kitchen. Kettle with modern style to give that perfect look for your kitchen. The Cambridge kettle is a great choice for the home or office. 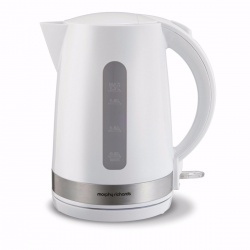 It is a classic metal kettle with a super-fast ‘rapid boil zone’ which means it can heat up a cup of tap water to boiling in just 45 seconds –really handy for those times when you could ‘kill for a cuppa’. The kettle has a handy ‘perfect pour’ spout design so the water can be poured evenly into mugs and cups without spluttering and spilling all over your worktop. It also has an internal water level indicator so you only need to boil just enough water 1, 2 or 3 cup volumes. To keep your kettle clean and fresh, and free from limescale, it has a removable, washable filter that you can simply flip out, rinse through and pop back in. For a tasty cuppa every time, The Cambridge kettle is an ideal choice and is a choice that won’t let you down in the style stakes either. 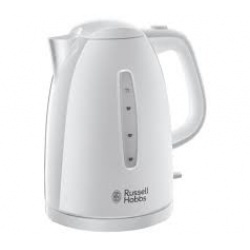 Maximum screen size compatibility 9.7 "
The Russell Hobbs White Textures Kettle is practical, stylish and combines good looks with a host of essential design features. With its unique matt and high gloss finish in clean, fresh white it will earn pride of place in the heart of your kitchen. The White Textures Kettle brings you a level of functionality you won't find in other kettles in its price range, it brings you style and quality on a budget. The Textures White Kettle combines a high gloss finish with matt accents for a premium feel meaning it will bring style to any kitchen work top. With a 1.7litre capacity jug, it’s big enough to make up to six cups, making it an ideal kettle for family homes but if you’re one for a sneaky brew the rapid boil feature means you can have a brew in hand in under one minute*. The rapid boil feature also means that you can become more energy efficient and save up to 66% energy when making one cup. The kettle has a perfect pour spout so all of the water goes into the cup with fewer splashes and spills keeping your work surface mess-free. This kettle really does think of everything. It has a removable, washable filter to keep your water clean and free from debris; this sits inside the spout and can be easily taken out, rinsed under the tap and replaced. The 21270 sits on a 360° base so it can be comfortably used whether you are right or left handed and to keep your work top clutter free the base also has integrated cord storage so it can be stored away at your convenience. The dual water window means you can clearly see the level when filling up the jug from either side meaning overfilling is a thing of the past. Kettle with a modern design to give that perfect look for your kitchen.